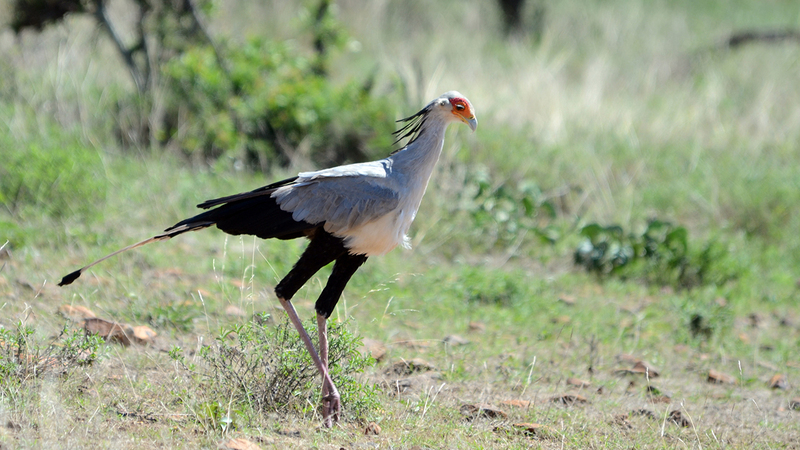 Secretary birds are famed for their snake-hunting skills. In fact, their scientific name, Sagittarius serpentarius, loosely translated means “snake archer.” Native to Africa, they hunt on the ground rather than from the air like most other raptors, but spend their nights high above the savanna in acacia trees. How much territory can secretary birds cover in a day while hunting on the ground? They can cover 20 miles (32 km). Heavy-duty scales protect their legs as they walk through large swathes of brush in search of prey, which can include the deadly puff adder. 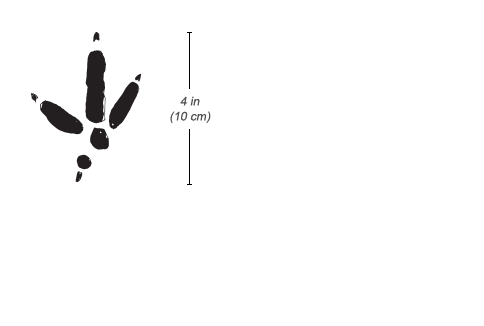 Tracks: Short back toe leaves a shallow impression and is not aligned with middle front toe. Monogamous pairs of secretary birds maintain a territory that can be as large as 19 square miles (50 km2). Sometimes small groups will hunt in the same area. Breeding pairs in their nests make burping growls. A similar sound is made during courtship or when they are defending their nests. 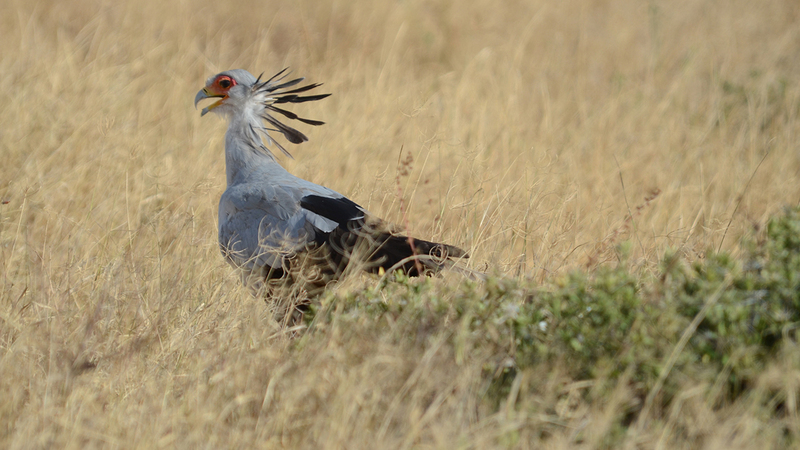 Secretary birds are active from dawn to dusk, although they rest in the shade during the hottest times of the day. They are known to walk 20 miles (32 km) or more a day across the savanna in search of food. Heavy-duty scales protect the lower parts of their legs as they walk through the grass. They will seek out areas that have recently burned to find prey that didn’t have time to escape. When they catch something, they spread their wings and raise the feathers on the back of their neck in what some call a terror display. At night, they fly up to their treetop roosts. The number of secretary birds is declining across its range due to habitat destruction and the expansion of human populations. It is believed that the bird may no longer exist in parts of West Africa. The International Union for Conservation of Nature (IUCN) currently lists this bird as vulnerable. 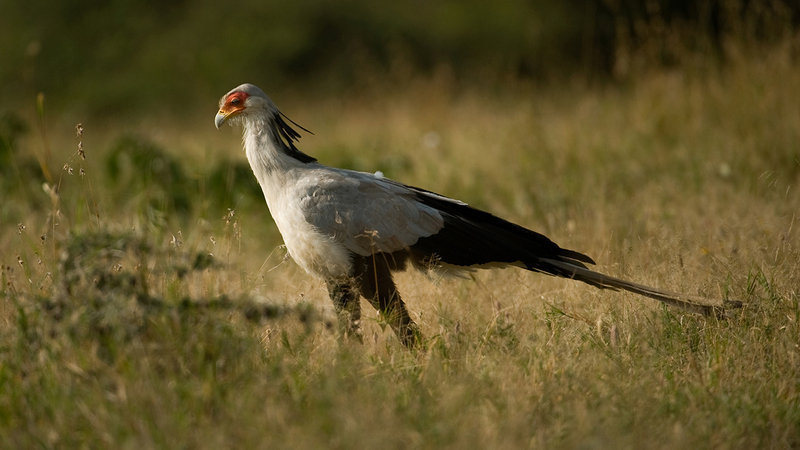 Secretary birds feed on small mammals, insects, and snakes, including poisonous cobras and adders. They chase prey down, then either stab it with their bill or stomp on it with their feet to stun or kill it. Most prey is swallowed whole. 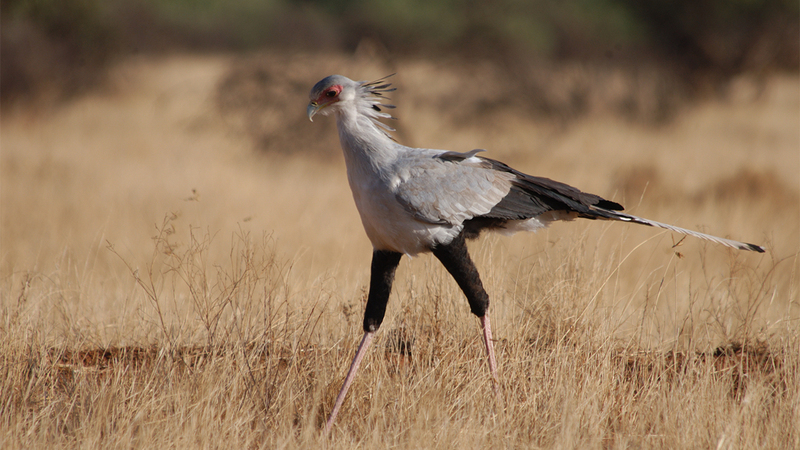 Breeding among secretary birds takes place in the air and can occur year-round. A breeding pair spends as long as six months building a treetop nest that they typically use for many years. Made of twigs, dung, leaves, and grass, it can be as large as 8 feet (2.4 m) across. A female may have more than one brood a year. Each time, she lays one to three eggs and does most of the incubation. Both parents feed the chicks a diet of regurgitated food for a month before switching over to bits of small mammals and snakes that the parents drop into the nest. The chicks fledge at 12 weeks of age and learn how to hunt by joining their parents on the ground. After about another three months, the offspring leave their parents’ territory. Crows and kites attack secretary bird chicks, which are easy targets in treetop nests. Adult secretary birds have no known natural predators, although they are occasionally hunted by people. 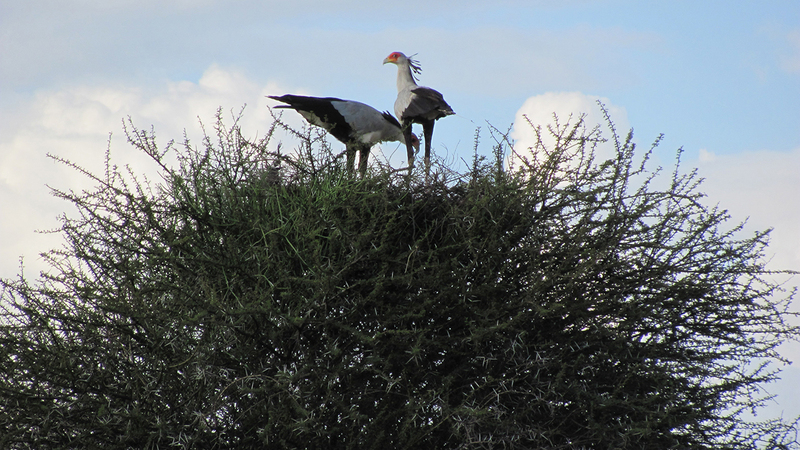 Secretary birds live throughout Kenya, except for arid areas. Populations across their range are declining. Secretary birds are found only in sub-Saharan Africa, from Senegal east to Somalia and south to South Africa. They prefer savannas with scattered acacia trees and short grasses—the better to see their prey! They also inhabit farmland, semi-desert areas, and clearings in woodlands. 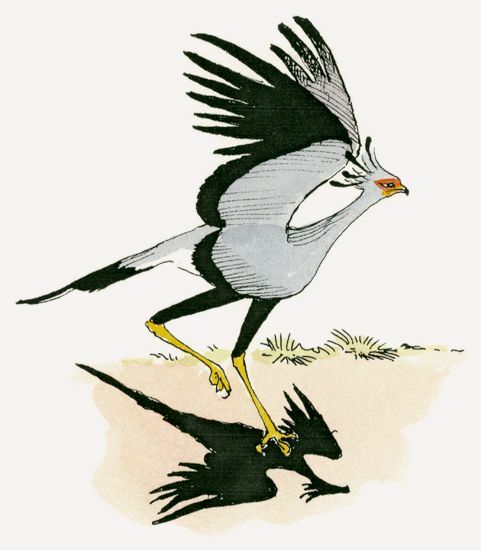 An image of the secretary bird appears on the coats of arms of Sudan and South Africa.